The use of options can be interpreted as buying or selling insurance. This post follows up on a previous post that focuses on two option strategies that can be interpreted as buying insurance – protective put and protective call. For every insurance buyer, there must be an insurance seller. In this post, we discuss two option strategies that are akin to selling insurance – covered call and covered put. The previous post discusses the strategies of protective put and protective call. Both of these are “buy insurance” strategies. A protective put consists of a long asset and a long put where the long put is purchased to protect against a fall in the prices of the long asset. A protective call consists of a short asset position and a long call where the long call option is purchased to protect against a rise in the prices of the asset being sold short. Both of these strategies are to buy an option to protect against the adverse price movement of the asset involved. When an insurer sells an insurance policy, the insurer must have enough asset on hand to pay claims. Now we discuss two strategies where the investor or trader holds an asset position that can be used for paying claims on a sold option. A covered call consists of a long asset and a short call. The insurance sold is in the form of a call option. The long asset gains in value when asset prices rise and the gains are used to cover the payments made by the call seller when the call buyer decides to exercise the call option. Therefore the covered call is to use the upside profit potential of the long asset to back up (or cover) the call option sold to the call buyer. The covered call strategy can be used by an investor or trader who believes that the long asset will appreciate further in the future but is willing to trade the long term upside potential for a short-term income (the call premium). This is especially true if the investor thinks that selling the long asset at the strike price of the call option will meet a substantial portion of his expected profit target. A covered put consists of a short asset position and a short put. Here, the insurance sold is in the form of a put option. The short asset is used to back up (or cover) the put option sold to the put buyer. A short asset position is not something that is owned. How can a short asset position back up a put option? The short asset position gains in value when asset prices fall. A put option is exercised when the prices of the underlying asset fall. Thus a put option seller needs to pay claims exactly when the short asset position gains in value. Thus the gains in the short asset position are used to cover the payments made by the put seller when the put buyer decides the exercise the put option. In this post, we examine covered call and covered put in greater details by examining their payoff diagrams and profit diagrams. As mentioned above, a covered call is a position consisting of a long asset and a short call. Here the holder of the long asset sells a call against the long asset. Figure 1 is the payoff of the long asset. Figure 2 is the payoff of the short call. Figure 3 is the payoff of the covered call. Figure 4 is the profit of the covered call. The strike price in all the diagrams is . We will see from Figure 4 that the covered call is a synthetic short put. Figure 1 is the payoff of the long asset position. When the asset prices are greater than the strike price , the positive payoff is unlimited. The unlimited upside potential is used to pay claim when the seller of the call is required to pay claim to the call buyer. Figure 2 is the payoff of the short call. This is the payoff of the call seller (i.e. the insurer). The call seller has negative payoff to the right of the strike price. The negative payoff occurs when the call buyer decides to exercise the call. The long asset payoff in Figure 1 is to cover this negative payoff. Figure 3 is the payoff of the covered call, the result of combining Figure 1 and Figure 2. Unlike Figure 1, the long asset holder no longer has unlimited payoff to the right of the strike price. The payoff is now capped at the strike price . Figure 4 is the profit of the covered call. The profit is the payoff less the cost of acquiring the position. At time 0, the cost is (the purchase price of the asset, an amount that is paid out) less (the option premium, an amount that is received). The future value of the cost of the covered call is then . The profit is then the payoff less this amount. The profit graph is in effect obtained by pressing down the payoff graph by the amount of . Because of the received option premium, is less than the strike price . 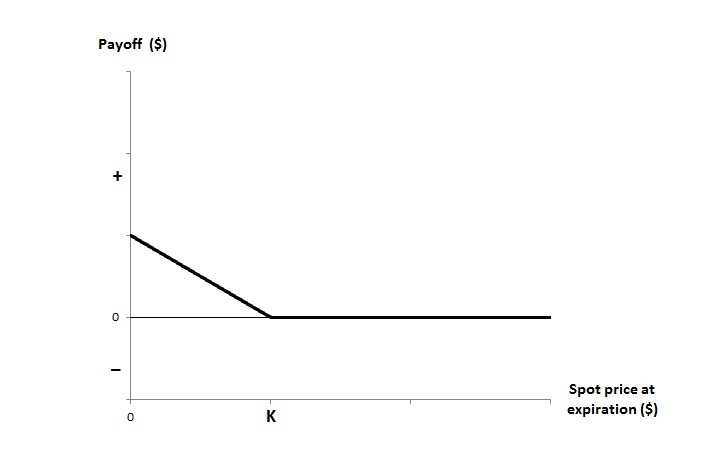 As a result, the flat part of the profit graph is above the x-axis. Without selling insurance (Figure 1), the profit potential of the long asset is unlimited. With the insurance liability (Figure 4), the profit potential is now capped at essentially at the call option premium. In effect the holder of a covered call simply sells the right for the long asset upside potential for cash received today (the option premium). The strategy of a covered call may make sense if selling at the strike price can achieve a significant part of the profit target expected by the investor. Then the payoff from the strike price plus the call option premium may represent profit close to the expected target. Let’s look at a hypothetical example. Suppose that the stock owned by an investor was purchased at $60 a share. The investor believes that the stock has upside potential and the share price will rise to $70 in a year. The investor can then sell a call option with the strike price of $65 with an expiration of 6 months and with a call premium of $5. In exchange for a short-term income of the call option premium, the investor gives up the profit potential of $70 a share. If in 6 months, the share price is more than $65, then the investor will sell at $65 a share, producing a profit of $10 a share ($5 in share price appreciation and $5 call premium). If the share price is below the strike price is 6 months, the investor then pockets the $5 premium. Note the similarity between Figure 4 above and the Figure 11 in this previous post. 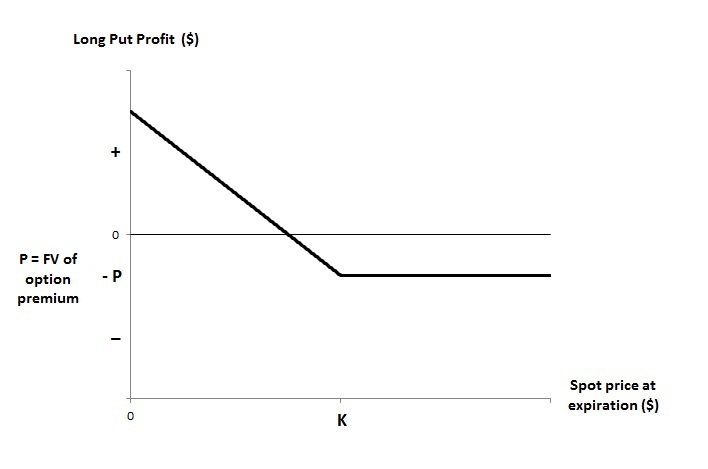 Figure 11 in that previous post is the profit diagram of a short put. So the covered call (long asset + shot call) is also called a synthetic short put option since it has the same profit as a short put. As indicated above, a covered put is to use the profit potential of a short asset position to cover the obligation of a sold put option. Figure 5 below is the profit of a short asset position. 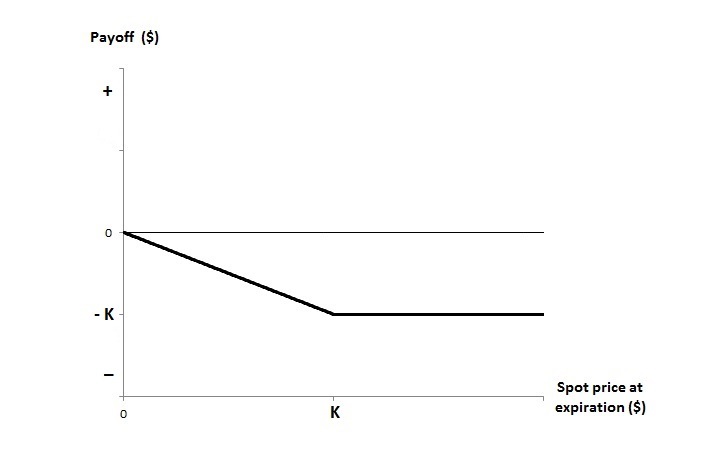 Figure 6 is the payoff of a short put option. Figure 7 is the payoff of the covered put. Figure 8 is the profit diagram of the covered put. 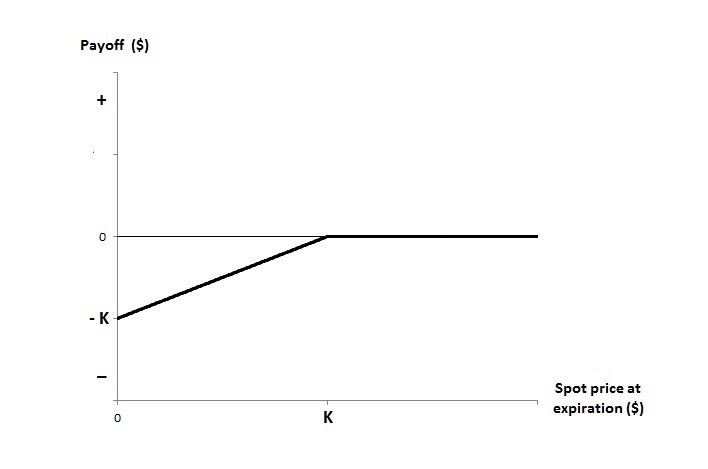 Figure 5 is the payoff of the short asset position. Holder of a short asset position is concerned about rising prices of the asset. The holder of the short borrows the asset in a short sales and sells the asset immediately for cash, which is then accumulated at the risk-free rate. The short position will have to buy the asset back in the spot market at a future date to repay the lender. If the spot price at expiration is greater than the original sale price, then the short position will lose money. In fact the potential loss is unlimited. 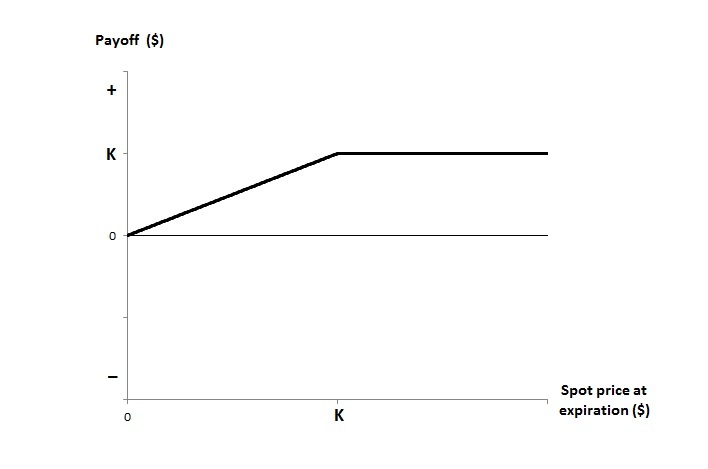 Figure 6 is the payoff of a short put option. Recall that the short put payoff is from the perspective of the seller of the put option. When the price of the underlying asset is below the strike price, the seller has the obligation to sell at the strike price (thus experiencing a loss). When the asset price is above the strike price, the put option expires worthless. Figure 7 is the payoff of the covered call. With the covered call, the holder of the short asset can no longer profit by paying a price lower than the strike price for the asset to repay the lender. 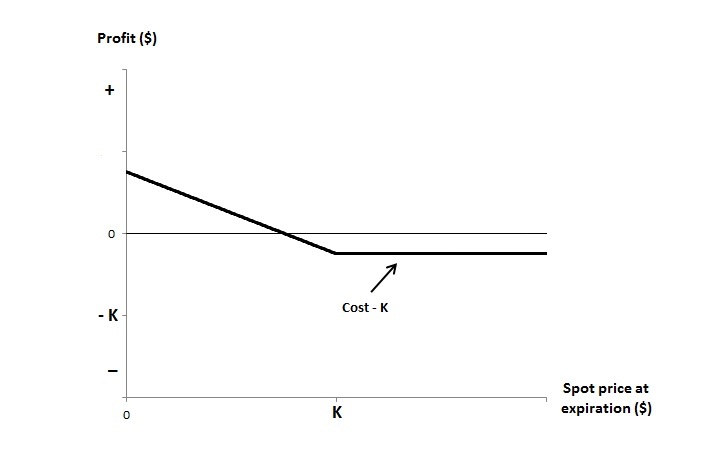 Instead he has to pay the strike price (this is the flat part of Figure 7). To the right of the strike price, the covered call continues to have the potential for unlimited loss. Figure 8 is the profit of the covered put, which indicates the profit is essentially the option premium received by selling the put option. Without selling the insurance (Figure 5), the short asset position has good profit potential when prices fall. With selling the insurance, the profit potential to the left of the strike price is limited to the option premium. The covered put is in effect to trade the profit potential (when prices are low) with a known put option premium. Compare Figure 8 above with Figure 5 in this previous post. Both profit diagrams are of the same shape. 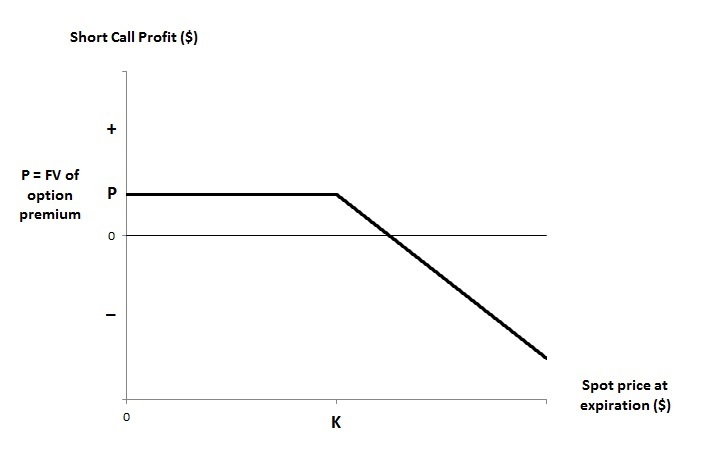 Figure 5 in the previous post is the profit diagram of a short call. So the combined position of short asset + short put is called a synthetic short call. Just a couple of more observations to make about synthetic put and synthetic call. 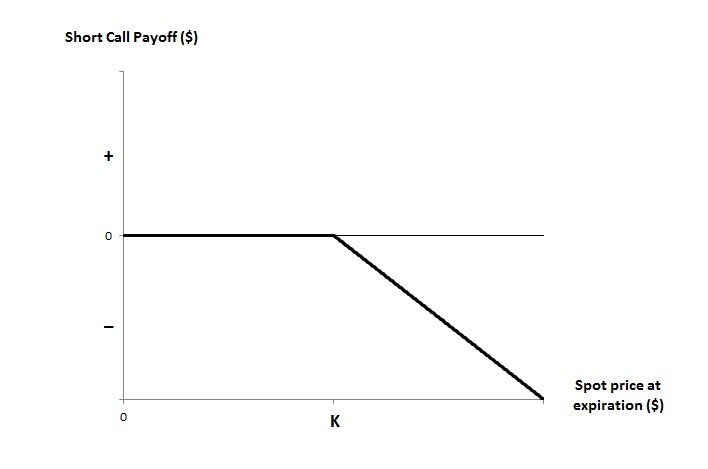 Note that Figure 3 (the payoff of long asset + short call) also resembles the payoff of a short put option, except that the level part of the payoff is not at the x-axis. So Figure 3 is the lifting up of the usual short put option payoff by a uniform amount. That uniform amount can be interpreted as the payoff of a long zero-coupon bond. Thus we have the following relationship. As mentioned earlier, the above relationship indicates that the combined position of long asset + short call can be viewed as a synthetic short put. We now see that the covered call is identical to a short put. The above relationship is the basis for calling “short asset + short put” as a synthetic short call. This post follows up on a previous post, which is an introductory discussion on options. In this post, we focus on the two basic strategies of using options as insurance – protective put and protective call. These two strategies are for investors or traders who want to buy insurance to protect profits that come from holding either a long or short position. For every insurance buyer, there must be an insurance seller. In the next post, we discuss covered call and covered put – basic strategies for investors or traders who want to sell insurance protection. Suppose that an investor has been holding an asset that has gained in value. The long asset position held by this investor will suffer a loss if prices fall. A long put option (a purchased put) has positive payoff when prices are less than the strike price. Buying a put option will guarantee a minimum sale price (the strike price of the put option) should the investor wishes to sell the asset at a future date. Thus the risk management strategy of buying a put option to guard against the loss of a long position is called a protective put. A protective call deals with an opposite situation. Suppose an investor or trader is holding a short position on an asset (e.g. the investor has short sold a stock). The short asset position held by this investor will suffer a loss if prices increase. A purchased call option has positive payoff when the asset prices are greater than the strike price. When the investor buys a call option with the same underlying asset, the strike price is in effect a minimum purchased price of the asset should there be a price increase, thus keeping the loss at a minimum. Thus the risk management strategy of buying a call option to guard against the loss of a short position is called a protective call. Protective puts and protective calls are basic insurance strategies that can be used to protect profits from either holding a long asset position or a short position. Both of these strategies will minimize the loss in the event that the prices of the asset position move in the wrong direction. Of course, the insurance protection comes at a cost in the form of an option premium, which is a cash fee paid by the buyer to the seller at the time the option contract is made. In the remainder of the post, we examine the protective put and the protective call in greater details by examining the payoff and profit diagrams. The put and call considered here are European options, i.e., they can be exercised only at expiration. The protective put consists of a long asset position (e.g. owning a stock) and a long put option on the same asset. Our goal is to examine the payoff and profit of this combined position. We can then make some observations based on the profit diagram. Figure 1 is the payoff of the long asset. Figure 2 is the payoff of the long put option. Figure 3 is the payoff of the combined position. Figure 4 is the profit of long asset + long put. The strike price in all the diagrams is . Instead of using a numerical example to anchor the diagrams, we believe that the following diagrams of payoff and the profit are clear. In fact, getting bogged down in a numerical example may make it harder to see the general idea. Asking questions such as – what happens when the asset is less than , etc – will make the diagrams clear. In fact, reading the diagrams is a good concept check. An even better practice is to draw the payoff and profit diagrams on paper. 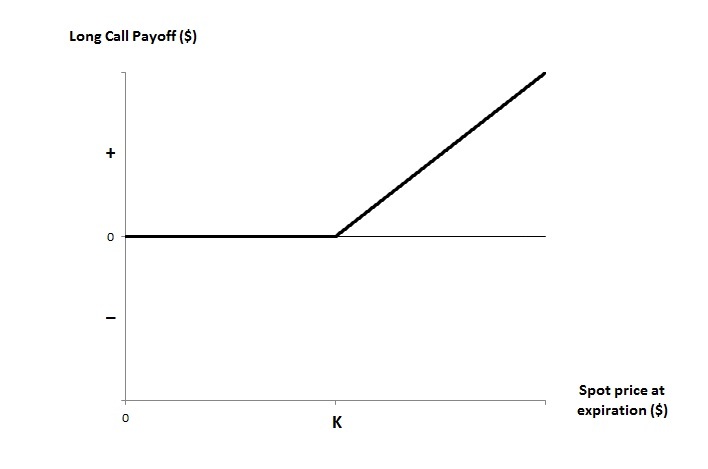 Figure 1 is the payoff of the long asset. 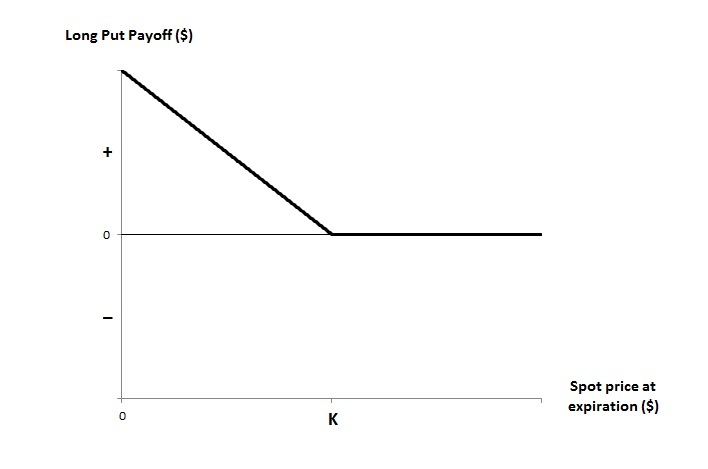 The strike price has no effect on the payoff of the long asset (Figure 1). The payoff of an asset is simply the value of the asset at a point in time. Thus the payoff is simply the asset price at a target date. The higher the asset price, the higher the payoff. Figure 2 is the payoff of the long put option. For the long put, the payoff is when it makes sense for the put option buyer to exercise. Thus the payoff is positive to the left of . To the right of , the put option expires worthless, thus the payoff is 0. The sum of Figure 1 and Figure 2 gives Figure 3. Figure 3 is the payoff of Long Asset + Long Put. The payoff to the right of the strike price is flat, which is a sign of the insurance at work. The positive payoff of the long put neutralizes the effect of falling prices of the long asset, minimizing the loss from holding a long asset when the prices go south. This position of long asset + long put will enjoy the upside potential in the event that prices go up. Of course, such as good insurance product is not free. The next diagram will take cost into account. First, the following formula shows the payoff of long asset + long put. Figure 4 is the profit of long asset + long put. Recall that the profit of a position is the payoff less the cost of acquiring that position. What is the cost of acquiring a long asset and a long put? The cost of the long asset is , the future value of the price paid at time 0. The cost of the long put is , where is the put option premium paid by the buyer to the seller at time 0. Thus the cost of the long asset + long put is . 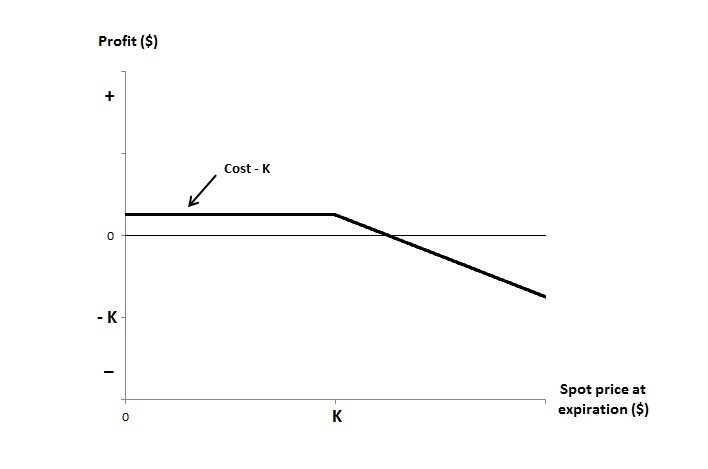 As a result, the profit graph is Figure 4 is obtained by pressing down the payoff in Figure 3 by the amount of the cost. The cost of the position is likely to be more than the strike price . This is why in Figure 4 is negative. Without the insurance (Figure 1), the long asset position will suffer substantial loss in the event that the prices are low. With insurance (Figure 4), the potential loss for the long asset position is essentially the put option premium. But the long asset position still enjoys the upside profit potential (less the option premium). Another observation that can be made about Figure 4 is that its shape is very similar to the profit of a long call option (compare Figure 4 above with the Figure 1 in this previous post). The profit diagram of long asset + long put does not merely resemble the profit of a long call (with the same strike price); it is identical. Based on Figure 4, the investment strategy of long asset + long put mimics the profit of the long call position (with the same strike price). Thus the position of long asset + long call is called a synthetic call option. The protective call consists of a short asset position (e.g. shorting a stock) and a long call option on the same asset. We now examine the payoff and profit of this combined position. 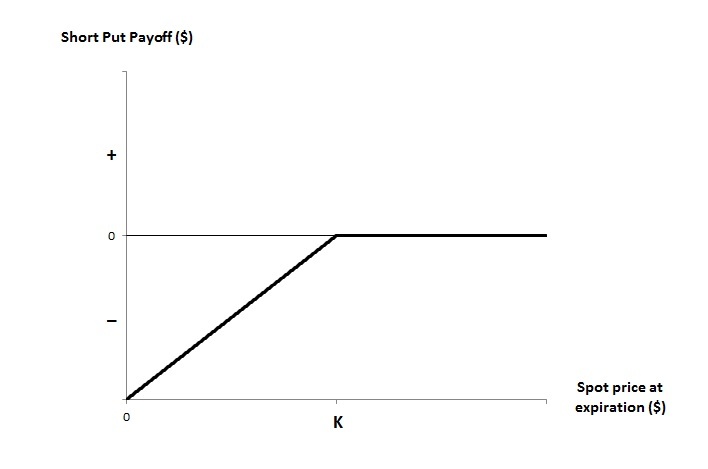 Figure 5 is the payoff of the short asset. Figure 6 is the payoff of the long call option. Figure 7 is the payoff of short asset + long call. Figure 8 is the profit of short asset + long call. The strike price in all the diagrams is . From Figure 8, we will see that the combined position is a synthetic put option. Figure 6 is the payoff of the long call position. When the spot price at expiration is less than the strike price , the call option expires worthless. When the spot price at expiration is greater than the strike price , the payoff is . Figure 7 is the payoff of the combined position of a short asset and a long call. The payoff of the combined position is flat to the right of the strike price. This is a sign of the insurance at work. The upside potential of the short call is limiting the loss of the short asset position. The positive payoff of the long call is . The payoff of the short asset is when price is greater than the strike price. Then the combined payoff is when price is greater than the strike price. To further clarify, the following is the payoff of the combined position. Figure 8 is the profit of short asset + long call. To derive the profit, we need to subtract the cost of acquiring the combined position from the payoff. 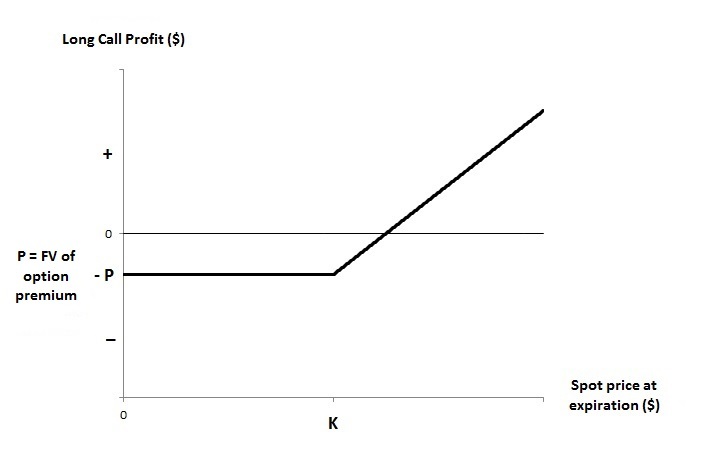 The profit graph is Figure 8 is the result of lifting up the payoff graph. That suggests that in this case the profit is the payoff plus a positive amount. This is indeed correct since the cost of acquiring the position is a negative number. Thus subtracting the cost from the payoff is in effect adding a positive number. To see the above point, the cost of acquiring the initial position is a positive number if it is a cash outflow (you pay to buy an asset) and is a negative number if it is a cash inflow (you sell an asset). In a short position, you borrow the asset and sell it to get cash, which is in this calculation. There is also the purchase of a call. Thus the total cost is , which is likely a negative amount. 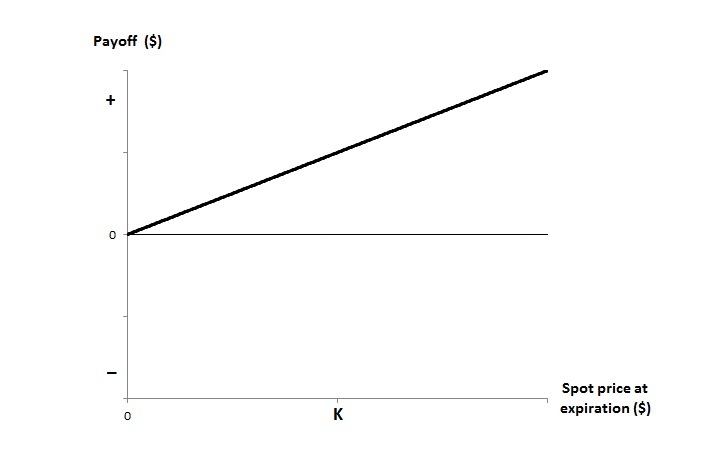 So subtracting this negative cost from the payoff has the effect of lifting up the payoff graph. 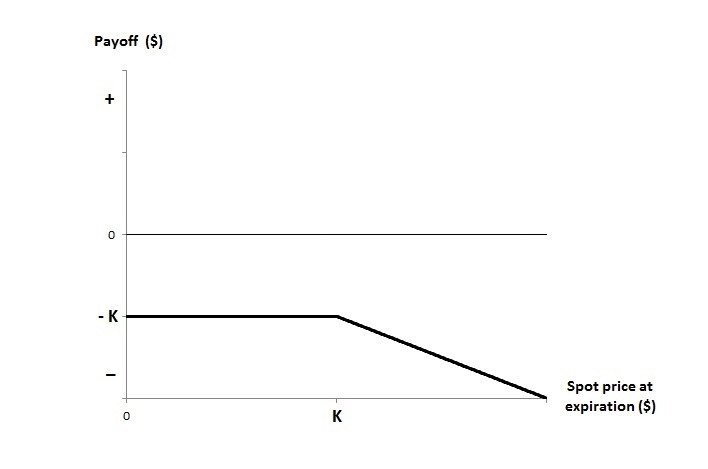 Without the insurance of a long call (Figure 5), the short asset position has unlimited loss. With insurance (Figure 8), the loss of the short asset position is minimized, essentially the call option premium. The short asset position still enjoys the profit potential should asset prices fall (less the option premium). Compare the above Figure 8 with the Figure 8 in this previous post, we see that they have the same shape. This is not coincidence. Both positions have the same profit. Thus the combined position of a short asset and a long call option is called a synthetic long put option since both have the same profit diagrams. Note that Figure 3 (the payoff of long asset + long put) also resembles the payoff of a long call option, except that the level part of the payoff is not at the x-axis. So Figure 3 is the lifting up of the usual long call option payoff by a uniform amount. That uniform amount can be interpreted as the payoff of a zero-coupon bond. Thus we have the following relationship. As mentioned earlier, the above relationship indicates that the combined position of long asset + long put can be viewed as a synthetic long call. We now see that the protective put is identical to a long call. The above relationship is the basis for calling “short asset + long call” as a synthetic long put. This post is an introductory discussion of options. After introducing the basic concepts and terminology, we use payoff and profit diagrams to highlight and summarize the risk and benefit characteristics of call and put options. There are two parties in a forward contract, the long position (the buyer) and the short position (the seller). The forward contract obliges the buyer (holder of the long position) to pay the forward price at expiration for the asset (of course the other side is obliged to sell at the forward price). The buyer is obliged to buy even when it is not advantageous for him to do so (i.e. when the price of the asset tumbles below the forward price ). Could there be a contract in which the buyer can buy when it is advantageous to do so and the buyer can walk away when it is not advantageous to buy? The answer to the above question is yes. This is a contract where the buyer (the long position) has all the upside potential but essentially has limited downside risk. This is a call option, which is a contract where the buyer has the right to buy as asset at a price set ahead of time but not the obligation to buy. To make the idea of a call option clear, let’s look at an example. Suppose that an investor buys a call option contract by agreeing to pay $40 for a share of XYZ company in 3 months. After 3 months, if the XYZ stock price is $50, then the investor will pay $40 for a share of XYZ, reaping a payoff of $10 per share. If the price in 3 months is $30, then the investor will walk away because he does not want to pay $40 for a share of stock that is worth less. A call option contract has two parties, the buyer (the long position) and the seller (the short position). In 3 months, if the XYZ stock price is $50 per share, then the seller will sell to the buyer a share of XYZ for $40 because the buyer will choose to buy. In this case, the seller is selling a stock that is worth $10 more than the selling price and thus has a loss of $10 a share. If in 3 months, the stock price is $30, then buyer will not buy so the seller is not obliged to sell. When the contract expires, the seller will have a payoff of $0 if the XYZ stock price is at or below $40 per share. On the other hand, the seller’s payoff is negative (i.e. has a loss) if the stock price at expiration is above $40 per share. The call option buyer buys the asset only when he makes money. The buyer’s payoff is potentially unlimited (when the stock price is through the roof) and is at worse $0. On the other hand, the seller’s payoff is at best $0 and is potentially unlimited when prices rise. Who would want to enter into such a contract as a seller (the short position)? There is definitely an imbalance in the example just described. To remove this imbalance, the seller must be compensated for taking the disadvantageous position of being a seller of a call option. The compensation is in the form of a call option premium. For example, the buyer of the option will have to pay the seller $2.78 for the privilege of being in the long position. When the XYZ share price is above $40, the seller has the obligation to sell a share at a loss. But the seller will be able to keep $2.78 when the share price is below $40. How to price options will be a subject in many subsequent posts. For now we just take the option premium as a given. The above example is for a call option. It is a contract where the buyer has the right but not the obligation to buy the underlying asset (this means that the counter party, the call option seller, has the obligation to sell). Another type of options is a put option. It is a contract where the buyer has the right but not the obligation to sell the underlying asset (this means that the counter party, the put option seller, has the obligation to buy). To make the discussion easier, let’s look at some standard terminology of options. Strike price (or exercise price). For a call option, it is the price at which the buyer will buy the underlying asset. For a put option, it is the price at which the buyer will sell the underlying asset. The strike price can be set at any value. Exercise. For a call option, this is the act of paying the strike price to receive the underlying asset. For a put option, this is the act of receiving the strike price to deliver the underlying asset. Regardless of the type (call or put), an option is exercised only when it is advantageous for the buyer to do so. Expiration. This is the date that is the deadline for the option being exercised by the buyer of the option. After the expiration date, the option will be worthless. Exercise style. The exercise style has to do with the timing of the exercise of the option. If the option can only be exercised on the expiration date, it is said to be a European-style option. If the option can be exercised at any time on or before the expiration date, it is said to be an American-style option. The distinction of “American” and “European” for options is not based on geography. Both types of options are traded worldwide. In the above example, the call option has a strike price of $40. It has an expiration of 3 months. After 3 months, if the stock price is over the strike price of $40, the buyer can choose to exercise the option. Since the buyer can only exercise on the expiration date, it is a European-style option. A call option is a contract in which the buyer has the right but not the obligation to buy the underlying asset at the strike price on or before the expiration (depending on the exercise style). This means that the counter party of the call option buyer (the call option seller) has the obligation to sell the underlying asset when the buyer decides to exercise. The call option seller is also called the call option writer. A put option is a contract in which the buyer has the right but not the obligation to sell the underlying asset at the strike price on or before the expiration (depending on the exercise style). This means that the counter party of the put option buyer (the put option seller) has the obligation to buy the underlying asset when the buyer decides to exercise. The put option seller is also called the put option writer. The assets that are transacted in option contracts can be financial assets (e.g. stock, stock index, currencies, and interest rates) or commodities (both physical commodities and commodity futures contracts). In the remainder of the post, we focus on European-style options. The payoff of a derivative contract is the value of the contract at a point in time. Knowing the payoff is not the entire story. To know how profitable the contract is, we need to subtract the cost of acquiring the position from the payoff. Thus the profit of a position is the payoff less the future value of the original cost of acquiring the position. A payoff diagram for a derivative contract is a graph in which the value of the derivative at one point in time is plotted against the price of the underlying asset. A profit diagram for a derivative contract is a graph in which the profit of the derivative at one point in time is plotted against the price of the underlying asset. Payoff diagrams and profit diagrams are important graphical tools to summarize the risk of the derivative contracts. We are only interested in the payoff value and profit at the time of expiration. We show three diagrams for each position – payoff of option, profit of option and the third one combining the option and a matching forward. Going through the payoff and profit diagrams below will go a long way to solidify your understanding of the definitions and risk and benefit characteristics of four option positions listed above. It is very easy to recite the basic definition of call option and put option. For someone new (or fairly new) to options, it can be confusing in going through these 4 option position. For example, even though the position of the short put should be a short position, it can actually be regarded as a long position in the sense that it represents an obligation of the put seller to buy the underlying asset and that the holder of the short put benefit from rising prices. Therefore, a good way of sorting out these 4 positions is to draw these diagrams on paper. Then compare your diagrams to the ones given here. First, the payoff diagram of a long call option. 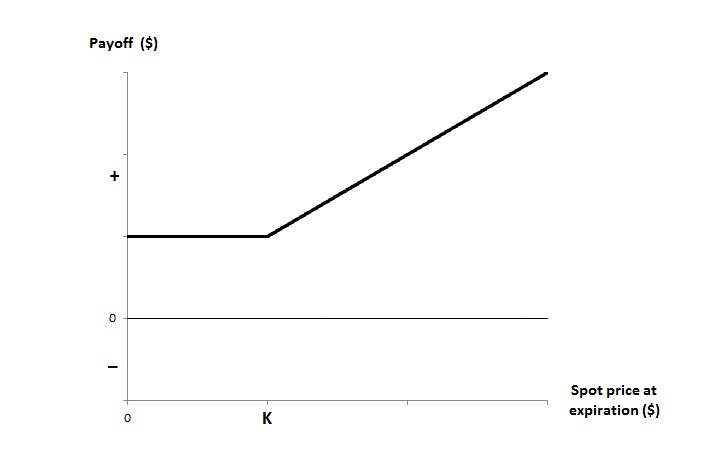 To the left of the strike price , the payoff graph in Figure 1 coincides with the x-axis. 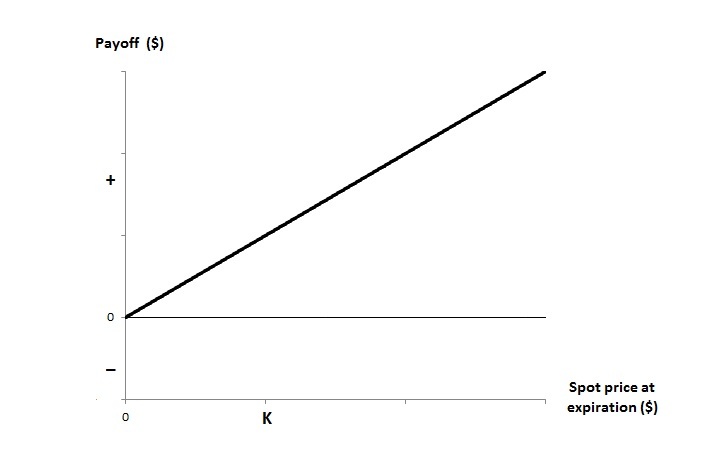 To the right of the strike price , the payoff graph is above the x-axis and increasing. The level part of the graph shows that this is an option – the right to walk away from the contract. The payoff is 0 on the left side of the strike price since the call buyer has no incentive to pay the strike price for an asset that is worth less than the strike price. To the right of the strike price , the payoff is the spot price less the strike price. The following summarizes the payoff of a long call where is the spot price of the underlying asset at expiration. The following is the profit diagram of a long call. The profit graph of a long call option has the same shape of the long call payoff graph. The profit graph is the result of adjusting the payoff graph downward by the amount of the call premium. When considering profit, it is necessary to subtract the call option premium from the payoff. The call option premium is paid at time 0. The payoff is at time . So the amount subtracted is the future value of the call option premium. Clearly the holder of the long call position benefit from rising prices. So does the holder of a long forward position. The following diagram compares a long call option with a long forward. 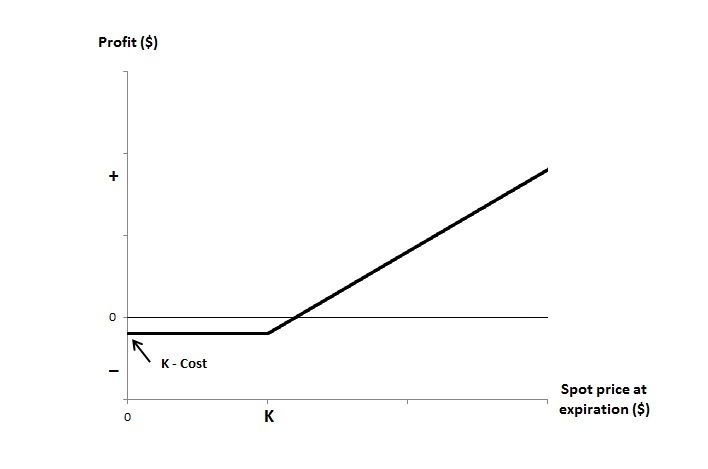 The dotted line in Figure 3 is the profit graph of a long forward. Note that it has no “flat” part. There is no optionality in a forward. Regardless of price movements, the forward contract holder (long or short) has the obligation to buy or sell. A long forward can be used to hedge against a price increase in the underlying asset. But the long forward position is exposed to risk if prices fall. When the asset price is below the strike place, the long forward position has the obligation to buy the underlying asset while the long call position has the right to walk away. The price of the right to walk away is the call option premium the long call buyer pays to call seller. One more comment about the long forward. For a forward contract, the profit and the payoff are identical since there is no initial cost of acquiring the forward contract. The counter party to the call option buyer is the call option seller. The following shows the payoff diagram and the profit diagram of a short call. 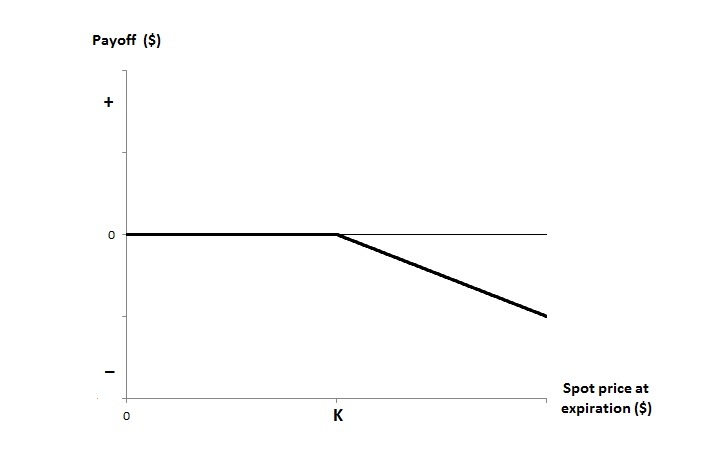 Comparing Figure 4 and with Figure 1, it is clear that the call seller loses money where the call buyer makes money (to the right of the strike price ). In fact the loss for the short call is unlimited as the spot price increases as the gain is unlimited for the call buyer. To the left of the strike price, the call option buyer has no incentive to exercise. Thus the payoff to the short call is 0 to the left of the strike price. 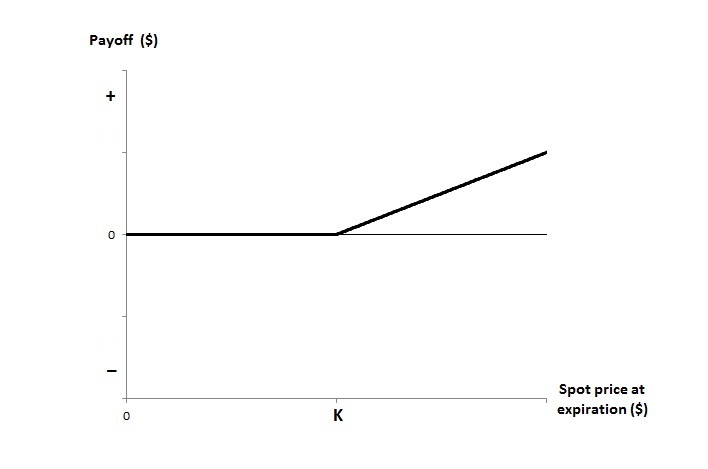 Figure 4 shows that the highest payoff for the short call option position is 0. As enticement, the payoff graph is lifted up by the amount of the call option premium to form the profit graph in Figure 5. The following further summarizes the payoff and profit of a short call option. Both the short call position and the short forward position have similar risk characteristics. 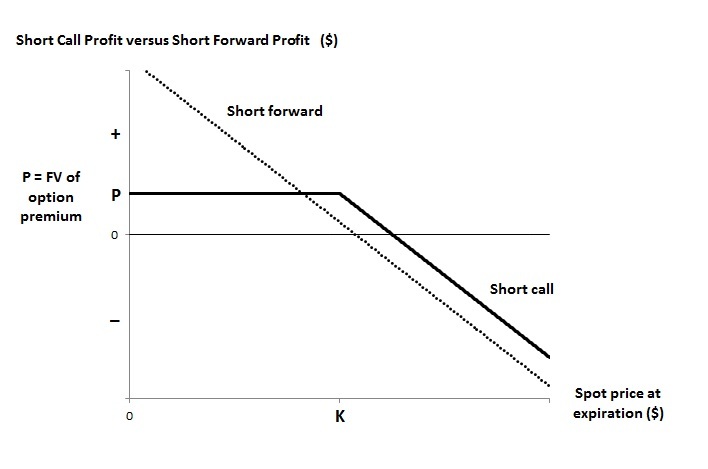 The following diagram compares a short call option with a short forward. The dotted line in Figure 6 is the profit of the short forward contract. Both the short forward position and the short call position benefit from falling prices, except that the profit of the short call position is capped at the call option premium. When price rises, both positions are similar in that the losses are unlimited, except that the loss for the short call is reduced by the amount of the call option premium. The following shows the payoff diagram and the profit diagram of a long put option. The dynamics of the put option are the opposite of the call option. Let’s compare Figure 7 with Figure 1. For a call option (Figure 1), the contract has positive payoff to the right of the strike price. For a put option (Figure 7), the contract has positive payoff to the left of the strike price. Thus a long call position makes money when prices go up and a long put position makes money when prices go down. Recall that a put option grants the right to its buyer to sell the underlying asset at the strike price. Thus when prices are low at expiration, the long put position can sell the asset at a price higher than what the asset is worth. 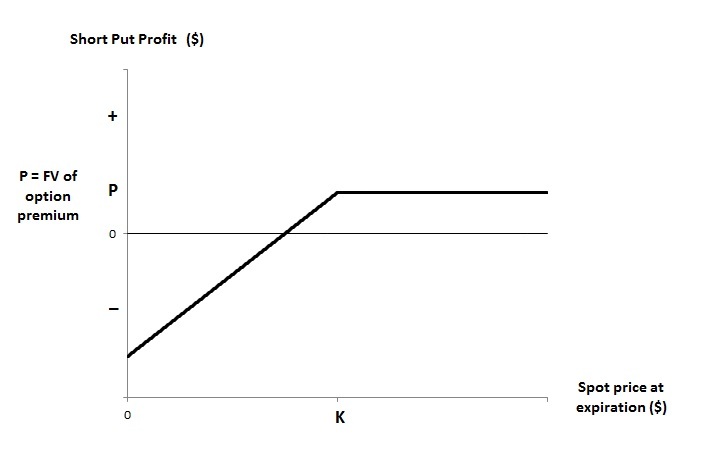 The profit graph in Figure 8 is obtained by lowering the payoff graph in Figure 7 by the amount of the put option premium. This is due to the fact that the put option buyer has to pay a premium to the seller to gain the privilege of walking away from the contract when the prices are higher than the strike price. The following further summarizes the payoff and profit of a long put option. Interestingly, the long put position and the short forward position have similar characteristics. The following diagram compares a long put option with a short forward. The dotted line in Figure 9 is the profit graph of the short forward. While the long put position can walk away when prices rise, the short forward position is still obligated to sell at a loss. Of course, the long put has to pay a premium for the right to walk away when price rises. One interesting observation is that the long put position can be regarded in some sense a short position despite the word long in its name. For example, the long put is a right to sell the underlying asset and the long put position benefits from falling prices. Note the similarity with the short forward position, which has an obligation to sell the underlying asset and which also benefits from falling prices. Recall that the short put option position (the seller of the put) has the obligation to buy the asset when the put buyer chooses to exercise. When the spot price at expiration is less than the strike price, the put seller will have to pay the strike price for an asset that is worth less than the strike price. 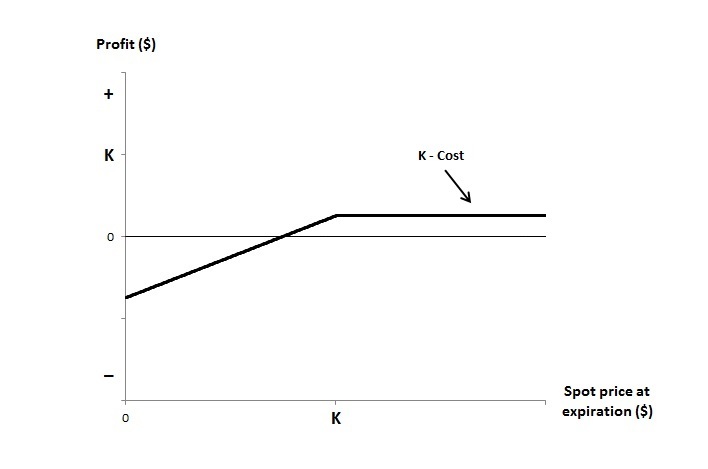 This explains the downward slope to the left of the strike price in Figure 10 and Figure 11. 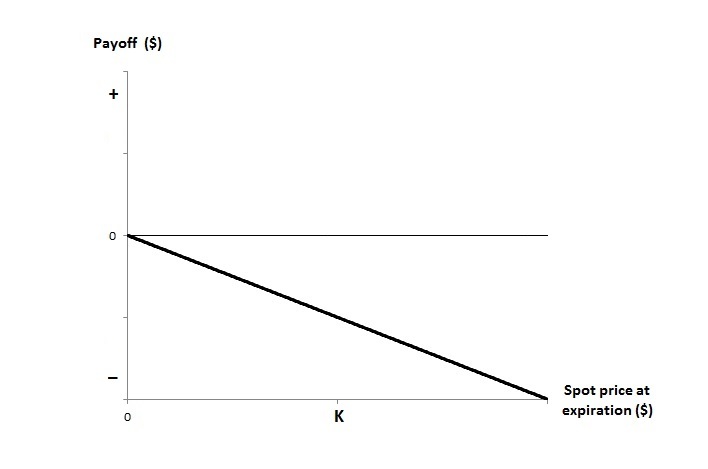 The flat part of both Figure 10 and Figure 11 reflects the optionality – the right of the put buyer not to sell an asset that is worth more than the strike price. For this right to walk away, the put buyer will have to pay a premium to to the put seller. This explains that the profit graph in Figure 11 is the payoff graph lifted up by the amount of the put option premium. The following further summarizes the payoff and profit of a short put option. The short put position and the long forward position are similar in some sense. 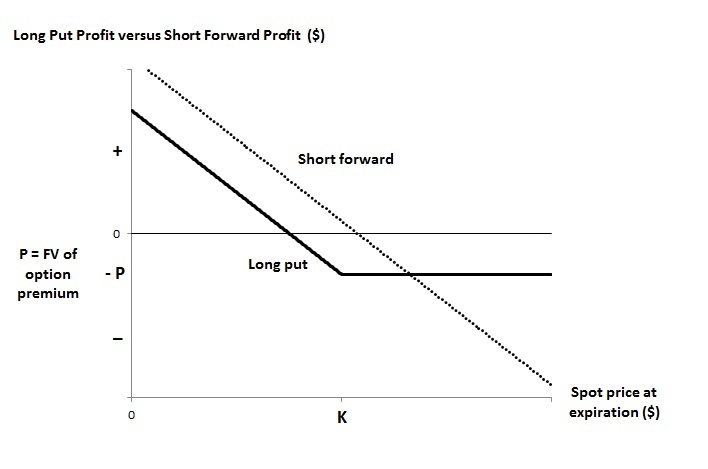 The following diagram compares a short put option with a long forward. 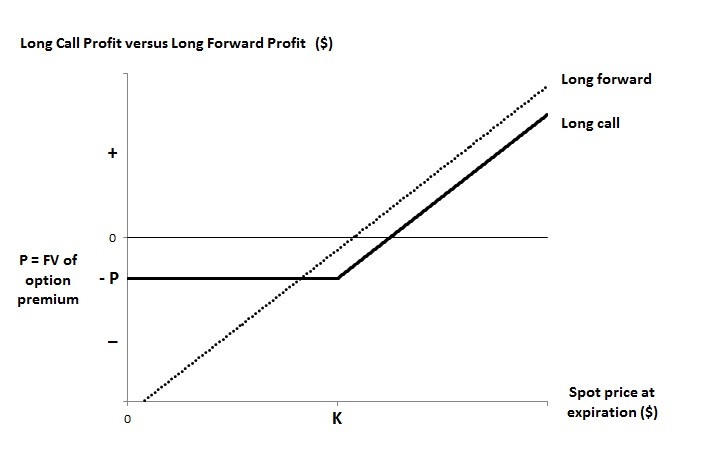 The dotted line in Figure 12 is the profit graph of the long forward. 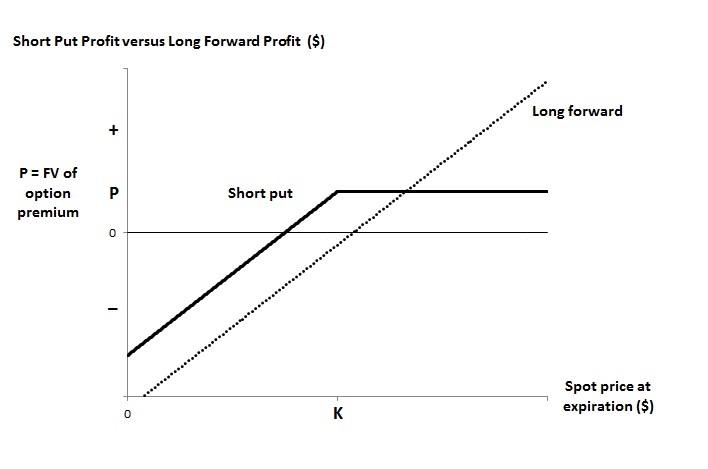 Figure 12 shows that both the long forward position and the short put position have substantial losses when price falls. The only difference is that the downside loss for the short put position is mitigated somewhat by the put option premium. One interesting observation is that the short put option position can be regarded as a long position despite its name has the word short. It can be regarded as long in the sense that a short put position is obligated to buy asset from the put buyer and that a short put position benefit from rising prices. If prices rise, then the put buyer will not exercise and the put seller can pocket the put option premium. Note the similarity with a long forward. A long forward is an obligation to buy the underlying asset and also benefit from rising prices. The only difference is that the gain for a long forward is unlimited when prices rise, while the gain for a short put is only the option premium. The risk and benefit characteristics discussed in all the above profit and payoff diagrams indicate that call options and put options can be used as insurance against loss in an investment position. For example, put option is an insurance against a fall in the price of an asset. Let’s say you hold an asset and are planning on selling it at some point in the future. The risk is that the price may fall at the time of sales. To insure against such an adverse outcome, buy a put option with the same underlying asset and with strike price and expiration that match your need. At expiration of the put option, you will have a guarantee of a minimum sale price of your asset, which is the strike price. For this reason, the purchase of a put option is called a floor. A put option is a protection against falling prices of a long asset position. On the other hand, a call option is insurance for an asset that we plan to own in the future. If we plan to buy shares of a stock at some future date, buying a call option on that stock now will guarantee a minimum purchased price. For this reason, buying a call option is called a cap. In general, a call option is a protection against rising prices for a short asset position. This subsequent post discusses the insurance strategies of protective put and protective call.